The Cordia pillow is all about simplicity, texture and a pop of color. 18″ x18″ Down fill. Do you want to ‘soften’ and cozy up your bedroom or living room? Soft pillows are on the top of the list of the ‘must haves’ of home accessories! Throw pillows give an instant makeover to any decor. Often a set of two is enough, you can coordinate it with another complimentary pair or have an odd number in a couple of different sizes. The Cordia pillow is all about simplicity, texture and a pop of color. 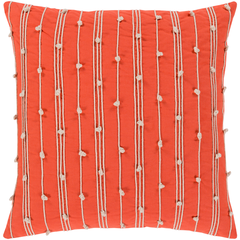 Embellished with a knotted twine hand made embroidery, Cordia with its bright orange color will energize any room.